On Saturday, May 11, Americans can send a powerful message about ending hunger by taking part in the Stamp Out Hunger Food Drive. Leave non-perishable canned goods by your mailbox that morning, and they will be picked up by your letter carrier and distributed to local food banks. Hunger is a silent but massive crisis facing over 50 million Americans. Lines of people are gathering at food pantries, which they depend on to get through difficult times. We have to make sure that food banks have enough supplies to meet the increasing demand. 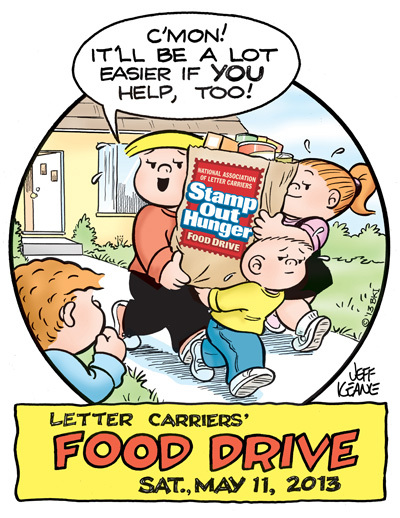 The Stamp Out Hunger Drive offers a quick and easy way to support the food banks. But more is needed. Congress must also be sent a message. Over the course of a year food banks cannot get by solely on the generous donations they receive from the community. They also need the help of the Federal Emergency Food Assistance Program (TEFAP). Congress has to get its priorities in order when making budget decisions. The American people can let them know that funding TEFAP is essential to holding the fort until we can get some significant economic recovery. On May 11, the National Food Drive offers you a chance to feed the hungry in your community and send a powerful message to Congress that eradicating hunger needs to be a priority. Article first published as Send Congress a Message with National Food Drive on Blogcritics.